Want to save up to 50% on your energy bills? Icynene® spray foam insulation can help you save up to 50% on heating and cooling costs every year. It provides air sealing, preventing heat loss and saving you money. 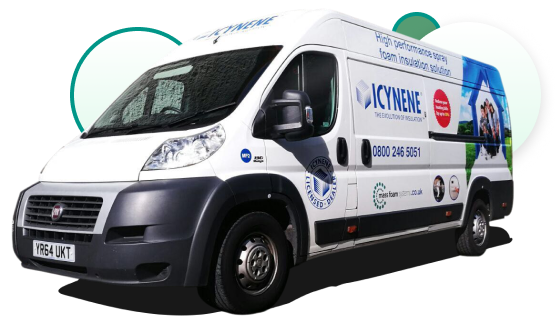 Installing energy saving Icynene® spray foam in homes across the south of England. Working with the UK’s biggest manufacturers to insulate and sound-proof all buildings. Mass Foam Systems can insulate all boats and marines with Icynene® insulation, whether the interior is made from metal, wood or plastic. A revolutionary method of reducing condensation, keep out the heat in summer and keep the cold out in winter for all types of storage containers. From feed stores to silage, we protect and enhance all types of buildings. From project inception to completion, our installers are available to work with you. Good company and great product. Recommend you use on any roofing applications it much better than cutting and fitting boarding. Mass Foam Systems are the UK’s No.1 Icynene® spray foam insulation company. We offer commercial application of Icynene® spray foam to solve condensation, soundproofing and insulation issues in all types of residential, commercial and industrial properties.